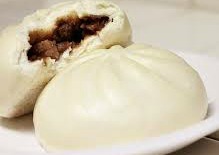 Siopao literally means “steamed bun” with yummy meat fillings. It is a famous Chinese-Filipino snack or street food. It’s mainly sold in Chinese restaurants or by sidewalk vendors in the Philippines. 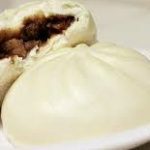 Pork Asado Siopao or Steamed Pork Bun is the most popular type and a favorite of many Filipinos including me. 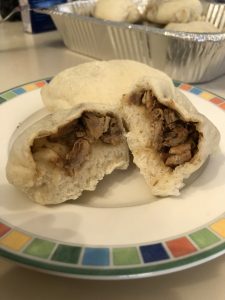 There are many kinds of fillings that can be used in this siopao recipe but pork asado is the most popular one. Making siopao or steamed pork bun is not as difficult as you think, if you have some experience in kneading dough, then making siopao is easy. The only tricky part is twisting and sealing the dough when you finished wrapping up the filling. It must have that fluffy and soft bun with yummy filling inside. 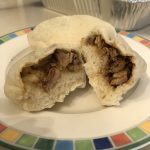 Here’s a Siopao with Pork Asado Filling recipe you can follow, Enjoy!!! Heat oil in a pan over medium heat then sauté the garlic and onion. Add the sliced pork and stir fry until the color turns light brown. Add the oyster sauce, soy sauce and sugar then stir and add 2 cups water, simmer for at least 45-60 minutes. Add the diluted cornstarch and stir until the sauce becomes thick then set aside. In a bowl or glass, pour in 2 cups of warm water, add the sugar, shortening and stir for a while to dissolve then sprinkle the yeast and set aside for at least 10 to 15 minutes. After 10-15 minutes you can now add the salt and olive oil in the bowl, mix well, add the flour and continue mixing till well blended; knead on floured board until smooth. 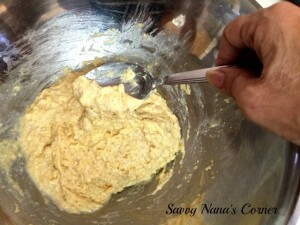 Shape the dough into a ball and place in a bowl greased with. Grease surface of dough. A little bit of olive oil so it won’t stick or you can buy a non-stick spray for food so it won’t stick on the bowl. Cover with wet cloth, foil or a food plastic wrapper and set aside for at least 60 – 120 minutes in a warm temperature place to let the dough rise. Then after that you can now punch down the dough and divide into desired sizes. 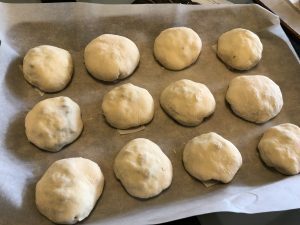 Form into balls and let them rise again for 30 minutes. Flatten dough with a rolling pin. Fill the center with prepared pork asado using spoon. Wrap the filling similar to wrapping a siomai and seal the dough by twisting the top and shape into small balls. Let the balls rise for at least 60 – 90 minutes or until double the size. And finally, steam at least 10 to 15 minutes or until cooked. Siopao (Pork Asado Filling) Filipino Recipe!!! In a bowl or glass, pour in 2 cups of warm water, add the sugar and stir for a while to dissolve then sprinkle the yeast and set aside for at least 10 to 15 minutes. [tonjoo_spb]Open the steamer right after 10 minutes and touch the buns. If the buns are fluffy and soft then its ready to serve. We’re planning my mom’s 80th. birthday party this summer and recently decided that we had enough kids attending that a kids’ table was in order. One of the things we had to worry about are food allergies,several of the children have egg and dairy allergies; my grandson Jett among them. We decided that we should design a kids’ menu that was egg and dairy free, thankfully no one has gluten allergies too. We have been trying different recipes to find food that kids love and will be fun too. 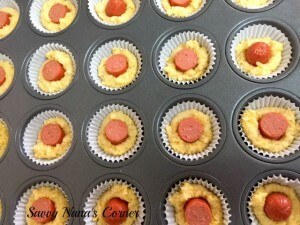 Here’s one of the recipes we will be serving on the kids’ table this summer, Egg & Dairy Free Mini Corn Dog Muffins. It’s very easy to make using just 4 ingredients. You can make it a head of time and freeze, just thaw out before serving. 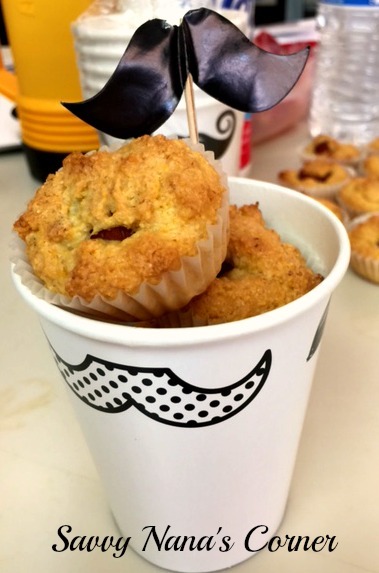 We thought it would be fun to make individual servings by placing 4 mini muffins in a paper cup and topping it with a party pick. You can serve it with packets or cups of ketchup and mustard for dipping. 1. In small container mix flax seed meal with warm water and let sit for 5-10 minutes. It will rise and seem fluffy. 2. In a medium bowl stir together Jiff mix, Soy Milk, and flax seed meal mixture. Batter will be lumpy. Let rest for 10 minutes. 3. Grease mini muffin pans well or line with mini cupcake liners. 4. Cut Hot Dogs in 8 sections along the length. Each piece should reach just below the rim of the mini cupcake when placed in the pan standing up. 5. Fill each cup about halfway and press a hot dog section in the middle of each. Hot dog section should be standing up. 6. Drop a small amount of batter on top of each hot dog. Spread it to the sides as close as possible. 7. Bake in 400 degree oven for 28 minutes or until golden brown. 8. Cool and serve or freeze in ziplock freezer bags. 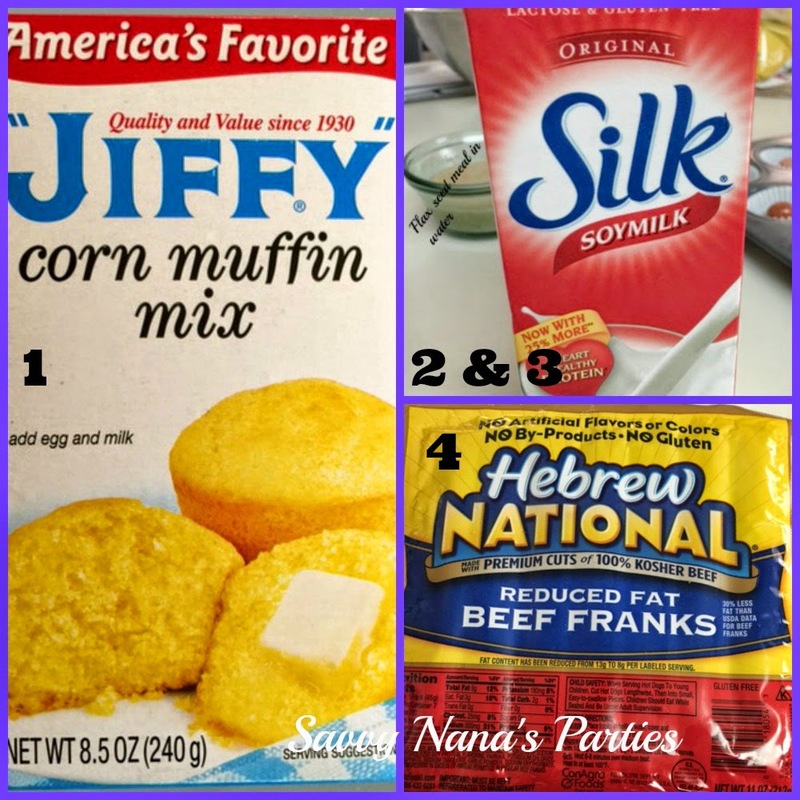 If you don’t have egg or dairy allergies you can make these using 1 egg and 1/3 cup milk as directed on the Jiff Mix box. 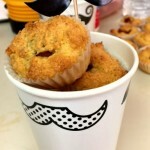 For parties put several muffins in a paper cup or other container and top with a cute party pick or other small decoration. In small container mix flax seed meal with warm water and let sit for 5-10 minutes. It will rise and seem fluffy. In a medium bowl stir together Jiff mix, Soy Milk, and flax seed meal mixture. Batter will be lumpy. Let rest for 10 minutes. Grease mini muffin pans well or line with mini cupcake liners. Cut Hot Dogs in 8 sections along the length. 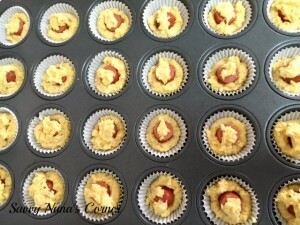 Each piece should reach just below the rim of the mini cupcake when placed in the pan standing up. Fill each cup about halfway and press a hot dog section in the middle of each. Hot dog section should be standing up. Drop a small amount of batter on top of each hot dog. Spread it to the sides as close as possible. Bake in 400 degree oven for 28 minutes or until golden brown. Cool and serve or freeze in ziplock freezer bags. If you don't have egg or dairy allergies you can make these using 1 egg and 1/3 cup milk as directed on the Jiff Mix box.